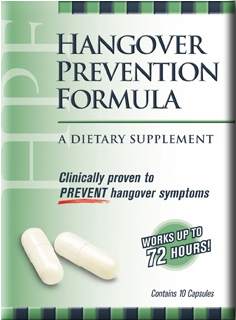 HPF provides protection from the "morning after" symptoms experienced after prolonged or excessive alcohol consumption. HPF contains Tex-OE™, a patented, all-natural extract formula derived from the fruit of the Prickly Pear Cactus and B-Vitamins. I love HPF - living in New Orleans my party lifestyle is more of a marathon than a sprint. While I try to eat right and sleep enough during crazy times like Jazz Fest and Mardi Gras that doesn't always happen. If I take HPF correctly - I can still function and still sneak in a workout even if I have over indulged. It provides clear and obvious relief of my hangover symptoms and keeps my strength up. People think I am a super hero - but really it is my HPF keeping going!